The big citrus preserving fest is just about over now. The Seville oranges have finished for the year and though there is always some citrus fruit available to buy all year round, with a plentiful supply of rhubarb just around the corner, I’ve had quite enough of the colour orange and am ready to don my rose tinted spectacles. Actually I haven’t made too much marmalade this year for one reason or another, but full of the usual good intentions still managed to buy the fruit anyway. So time to clear the decks. That bowl of kumquats that I searched so earnestly to find, that pomelo that has sat patiently in the kitchen for the last few weeks and the handful of ruby oranges that I had almost forgotten were there, all need using up pronto. And then there are unwaxed lemons, 2 limes with peel starting to yellow and 3 bog-standard oranges that somehow got mixed in with the blood oranges at the fruit and veg shop. Oh, and a few bitter Seville oranges too. So to celebrate the last of the citrus why not use the whole lot in one fell swoop. In some ways a recipe for this fruit-medley marmalade isn’t necessarily that useful to anyone else as the chances of you having the same mixture of fruits may be unlikely and the idea of going out with a shopping list for this exact combination fruitless. But knowing some basic principles for making marmalade is useful and can encourage everyone to use what they have as well as give you confidence to do your own thing if you fear stepping outside of the box. If that all sounds too much like hard work, by all means follow the recipe to the letter or sample a marmalade made earlier; pink grapefruit, rhubarb and cardamon marmalade or gooseberry and lime marmalade or perhaps lemon, fig and lavender marmalade, which is a good one for making just about any time during the year. I love marmalade with a tart edge to it rather than being too sweet, so using bitter oranges suits me down to the ground. There is a difference between a bitter marmalade and a BITTER marmalade, the latter caused by the inclusion of the fruit’s pith. An overpowering unpleasant bitterness somehow coats the inside of your mouth and stays with you for ages after you’ve eaten your toast! I also love peel in my marmalade, lots of peel. 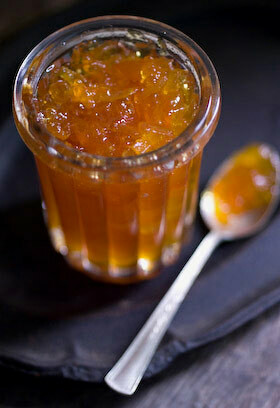 Without it marmalade would simply be jelly! Hand cutting peel can be a tedious part of the process and it is hard to get a really fine even cut. For me this is all part of the ceremony of marmalade making, though luckily I don’t make huge batches. I do have a special bean shredding attachment for my Kenwood Chef which can do the job neatly, easily and quickly, though rarely use it, but if you intend to make marmalade big time it might be worth finding something similar to streamline the job. The peel needs to be really well cooked first, seemingly overcooked, as it candies and hardens once it is boiled in the sugar syrup. Jane Hasell-McCosh, who founded and organises the annual Marmalade festival at her home, Dalemain Mansion, Nr Penrith, told me that undercooked peel is the most common reason for entries being marked down. The peel should first be cooked until when pressed between finger and thumb it disintegrates, and that can take between 1-2 hours of slow cooking to achieve. 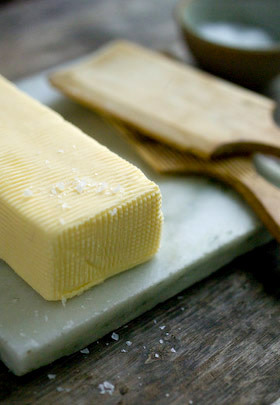 Of course, if you like a chewier texture, cook it for less time but don’t expect any rosettes for your efforts. Different kinds of citrus fruits contain varying amounts of pectin, the stuff that helps jam to set, so you do need to do whatever you can to make the most of what pectin there is. Tying pips and pith into a bundle with muslin and soaking them with the peel in the water or juice overnight helps to extract the available pectin. 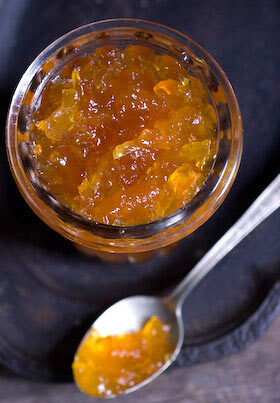 I have never found it necessary to add extra pectin to my marmalade. Use your own combination of citrus fruits. You could include grapefruits, mandarins and sweet oranges as alternatives. Roughly match the total weights shown in the recipe but don’t get too hung up on matching measurements exactly. Wash and scrub all the fruit and drain in a colander. Cut the kumquats lengthways into quarters and remove and collect the pips. 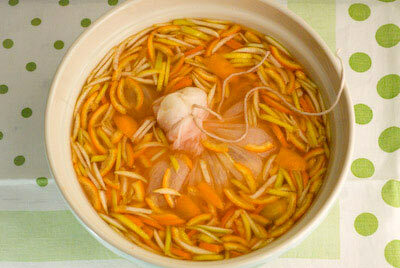 Remove the peel from the pomelo, Seville oranges and lemon. Pull away the thick pith from the pomelo and any from the oranges and lemon that comes away easily and discard it, then roughly chop the flesh from the fruits, collecting it together with any juice and the kumquat pips. Finely chop the peel into shreds. This made approximately 360g (12oz) chopped peel and 750g (1 1/2lbs) pips and flesh. 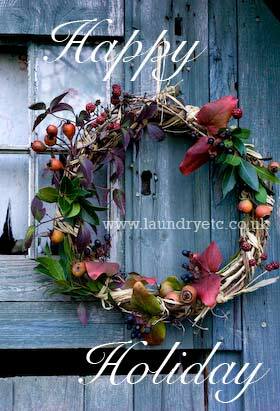 Wrap the pips and flesh into a bundle with muslin tied securely with string. Place the peel, muslin bundle, juice and water in a bowl and leave to soak for 12-24 hours. 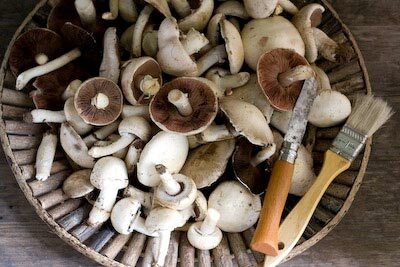 Put everything from the bowl into a pan with a lid, bring to a simmer and cook gently until the peel is soft, which may take 1 – 2 hours. Remove the muslin bag, collecting any liquid that drips from it. Separate the peel from the juice by pouring through a sieve over a bowl, then measure and weigh them both separately. At this stage it made 700ml (1 1/4pts) juice and 480g (1lb) cooked peel. To calculate how much sugar I needed I made two calculations; one for the amount of juice and one for the weight of the peel then added them together. I choose a classic sugar to juice ratio as used for making a jelly of 400g (14oz) sugar to every 600ml (1 pint) juice = 460g (1lb), plus 70% sugar to weight of peel = 336g (12oz). 460g (1lb) + 336g (12oz) = 796g Rounded up to 800g (1 3/4lbs). 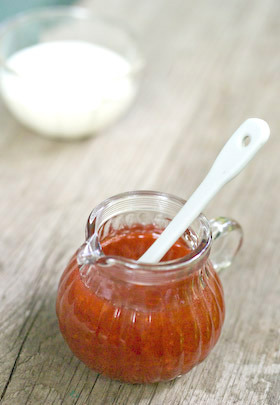 Prepare clean jars and lids by sterilising them in a low oven, keeping them warm till needed. If you plan to can (water process) your marmalade, prepare the water bath and jars and place jar seals in a pan of hot water on the hob. Place the peel, juice and sugar in a preserving pan and stir over a gentle heat until the sugar is dissolved, then turn up the heat and bring to a rolling boil until the marmalade reaches setting point (a blob of the syrup on a plate quickly forms a skin that wrinkles when you push a finger over it). This took me about 10 minutes to achieve. Skim if necessary and allow the marmalade to cool for 5-10 minutes then stir to distribute the peel. Pour the marmalade into hot jars and seal. If you are canning your jam, process for 5 minutes then remove from the canner. Leave till cold, then test the seals. Don’t forget to label and date your marmalade. Just drove up the road to my house and the road side is lined with windfall plums, like a guard of honor greeting me back home. 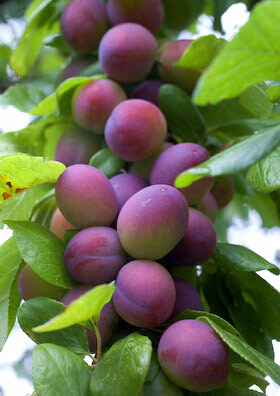 The plum thing round here is just about to kick off and I want to be ready to make the most of this abundant harvest. It’s on the doorstep and comes for free. 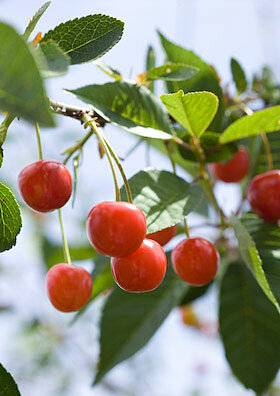 I have written about Blaisdons, our local plum variety before and last year bottled them, see here . 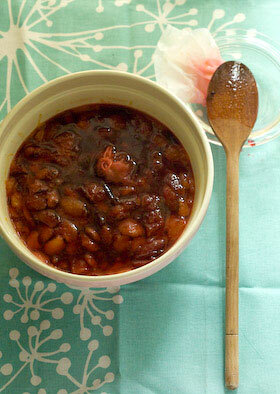 I also bottled squashed plums very simply, stoned and cooked in a light syrup. 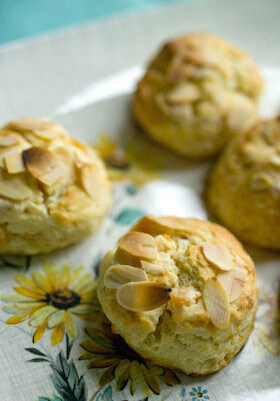 They were delicious and kept me in dessert for several months with custard, yogurt or cake. 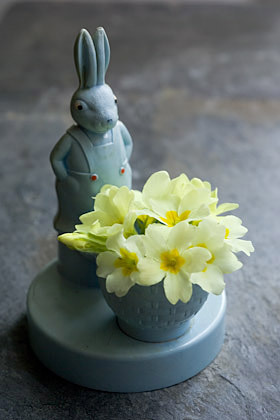 I need more of them alright, the larder needs to be well-stocked to take me through the winter. So to ease my way into the season I thought I’d start with a jam. I generally find plum jam quite uninspiring and one dimensional, so this jam called for the addition of careful thought to really make it sing. As I said on Facebook yesterday, good jam does not come from throwing everything in a pan and boiling like billio. That’s just stewing fruit and you end up with jars of sweet pink mush that somehow remain in the larder for years and that you are unable to ever get rid of. 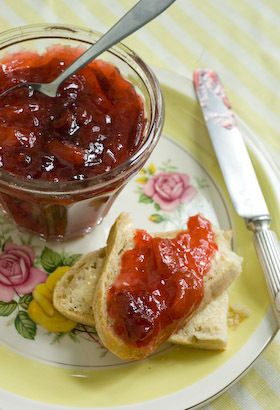 I want to make jam that is so fantastic that you quickly run out and vow you’ll make more next year. I like to macerate the fruit to draw out the juice and the fresh flavours and this method suits my way of life really well. It means you can begin to process your newly picked fruit at it’s freshest without having to get the jars and all the other paraphernalia ready. It gives you a day or two’s grace to get your head round the task in hand. You do need lots of bowls and in my kitchen and sitting room table-top space is often at a premium as bowls of fruit covered with cling film wait their turn, all topped and labeled with post it notes. 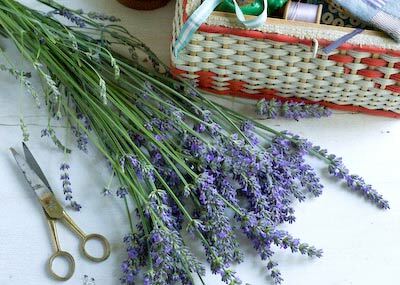 I mentioned in my last post that using lavender as a flavouring requires a light touch. It needs to be just present so it’s hard to put your finger on just what the flavouring is, to really work. This jam is delicious and is a brilliant colour too. The cooking time is kept to a minimum without too much sugar, so the plums have a tart edge to them, which any good jam should have in my opinion. 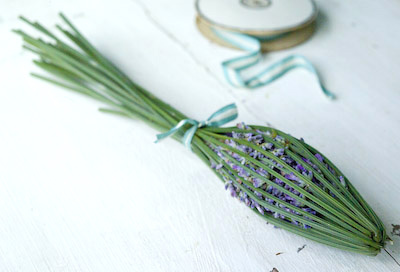 I used lavender recently harvested from the garden, so though dry is also very fresh. 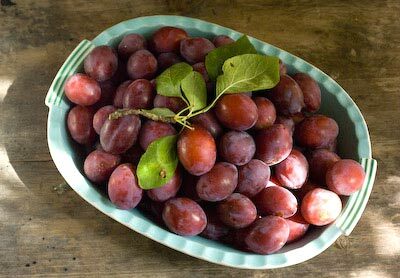 Blaisdon plums are a cling-stone plum, so you either remove the stones after cooking them, filching them out one by one, or you cut the flesh from the stone. Some of my plums were windfalls so I needed to cut off any bruised and manky bits, so the second method, though time consuming, worked well in this instance. I have no doubt that as the season progresses, stone filching will become tedious. Right now I’m just loving the thrill of anticipation. Blaisdons – bring them on! Chop the plums into quarters and remove the stones. 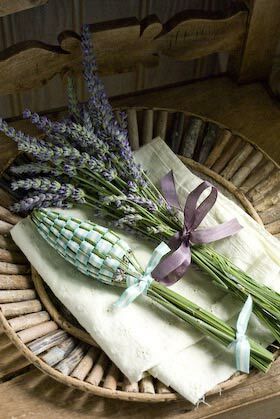 Place the fruit in a bowl layered with the sugar, add the lemon juice and push the lavender, tied in a piece of muslin, down into the fruit. Cover and leave overnight to macerate. 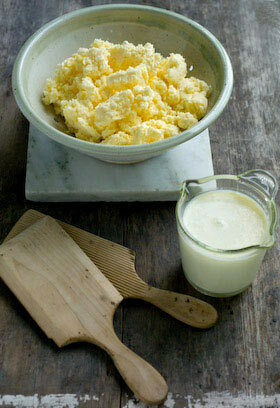 Next day, pour the contents of the bowl into a pan and heat it through stirring until the sugar is completely dissolved. 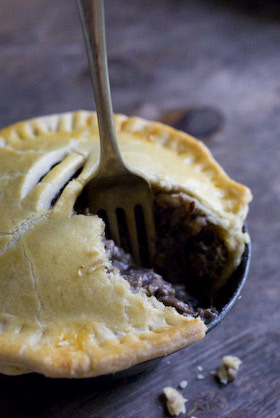 Bring to a simmer then remove from the heat, pour back into the bowl, push a piece of greaseproof paper down onto the surface of the bowl’s contents, then cover and leave to macerate for anything between 3 – 24 hours, whatever fits into your schedule. 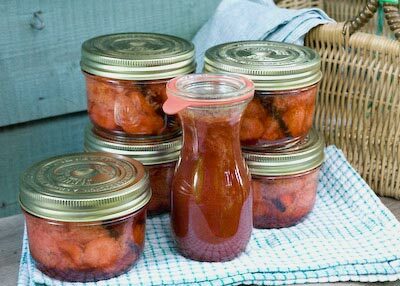 If you plan to can or water process your jam, prepare your jars and seals, otherwise make sure your jam jars and lids are clean and hot by placing them in a warm oven for 20 minutes. 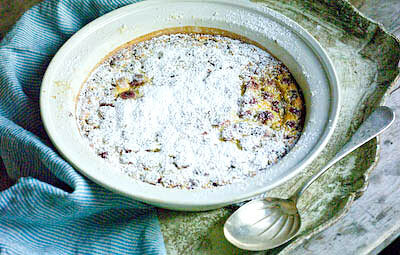 Remove the lavender bundle, then with a slotted spoon remove the plum pieces from the syrup. There is no need to be too painstaking about this, it just means that your finished jam will have some nice chunks of plum flesh instead of it all being cooked into an homogenised mass! Place the remaining syrup in a preserving pan, heat to boiling then maintain at a rolling boil until it reaches setting point. This took me about 10 minutes to achieve. Add the plum pieces and bring back to the boil and check for setting point again. Pour the jam into hot jars and seal. If you are canning your jam, process for 10 minutes then remove from the canner. Leave till cold, then test the seals. 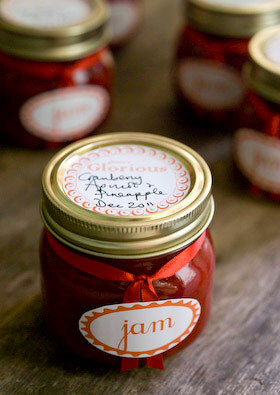 Label and date your jam. 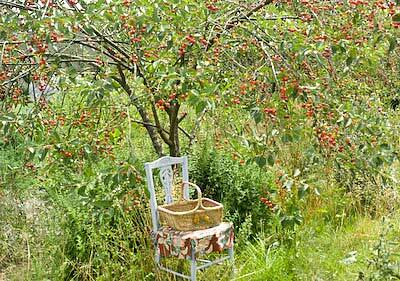 I’m so glad I made a concerted effort to get the preserving garden allotment sorted out earlier in the season. I’ve been distracted for the last few weeks so the plot has been neglected and there’s now much weeding to be done to make it all neat and tidy again. But sometimes a break is necessary if only to accept that to some degree, what will be will be. Now comes the payoff. 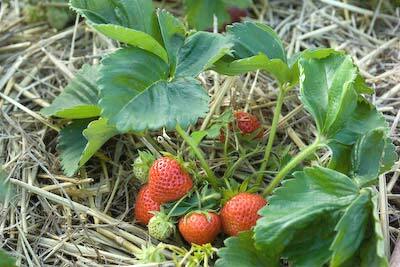 The berries are ripening and my longed for supply of strawberries has become a reality. The other day I picked my first substantial batch and there should be several more punnets full to come in the next few weeks. 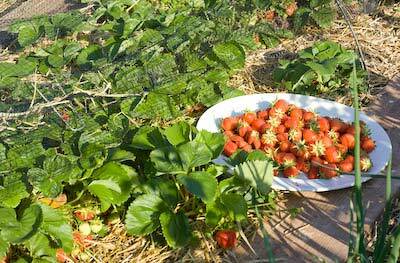 The bulk of my plants are Cambridge Favourite, which I chose as a classic jam making variety. Planted autumn 2009, there was no fruit to speak of last year and the plants sent out lots of runners, some of which I encouraged to root and establish. The plan was that this year would be the first season to expect any fruit and I’m not disappointed. The rule of strawberry picking is to chose a warm dry day for it and, of course, to eat as many berries, warmed by the sun, as you can, right there and then. These berries are just so sweet and packed with flavour. When picked that warmth quickly ‘cooks’ them and they lose their polished look in moments once they are detached from the plant, so you need to get them cooled fast. Even after my seasonal binge there were still 3 kilos of fruit to take home to preserve. I plan to make jam with subsequent pickings but for this first load I wanted to can compote and syrup, using my harvest as fresh as possible to capture this exceptional flavour. Strawberries aren’t highly rated for bottling as they overcook fast but making compotes to eat out of season to serve with yogurt or vanilla cheesecake or a simple sponge cake with cream …. well, that does it for me. This is were canning makes such sense. Jam is usually overladen with sugar and jam makers often complain that they have far too much of it to consume, but compote can contain much less sugar, so the flavour of the fruit shines through and by water processing it, you can then stock the pantry with jars that will keep throughout the year ahead. With canning generally, it is important to use jars that are a size that suits how many people you feed. I like to use smallish jars so once opened I know none will go to waste. My next door neighbours brought me these Le Parfait Familia Wiss 350ml jars back from France recently so they looked to be just perfect for the job. I canned the left-over syrup in a 250ml sized Weck flask and there is another half flask, in the fridge for using up now. The berries need to be macerated with sugar overnight so their lovely juice is drawn out, turning the sugar to syrup at the same time. I wasn’t sure how much syrup the berries would produce but there was enough left over to bottle on its own. This syrup is just fab stirred through Greek yogurt and I’ll be churning some vanilla ice cream soon to make another perfect partnership. 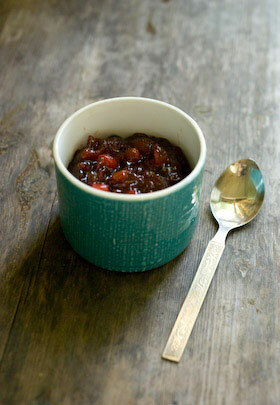 The compote will go with just about anything. Rinse and drain the fruit if you must! 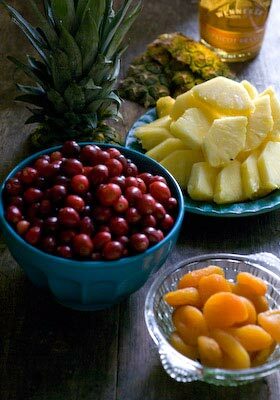 As I knew exactly where my fruit came from and that it had been mulched with straw to keep the berries clean and off the soil, I didn’t wash the fruit … so you choose! Remove the stalks and halve the largest berries then place in a large glass or ceramic bowl, sprinkling the sugar in layers between the fruit as you go. Split the vanilla pods and scrape out the sticky seeds then bury the pods and stir the seeds in amongst the berries. 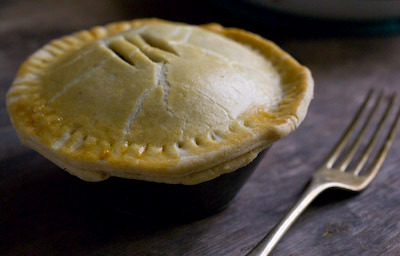 Cover the bowl with cling film or a plate and leave in a cool place or the fridge overnight. Prepare the water bath, jars and lids for canning*. 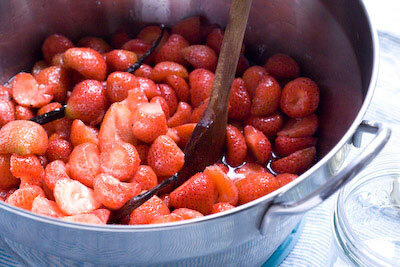 Pour the fruit, sugar, vanilla and any juice into a preserving pan. Warm it through stirring until all the sugar is dissolved. Add the balsamic vinegar then bring all to a simmer and cook through for 2 minutes. 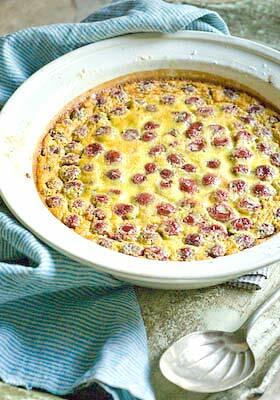 Using a slotted spoon or sieve remove the berries and vanilla pods from the syrup into a warm bowl. This way the softened berries will still be surrounded by syrup. (Some fruit pulp will remain in the syrup. 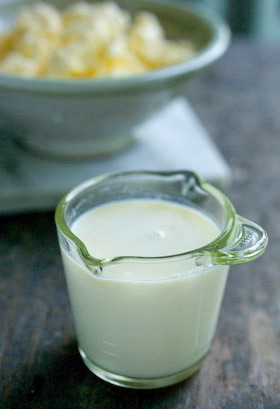 If you want to make a smoother syrup from your left-overs then pass it through a sieve.) Cut each vanilla pod into 3 then using a jam funnel, pack the strawberries into the jars, to come just below the headroom line for the type of jars you are using. 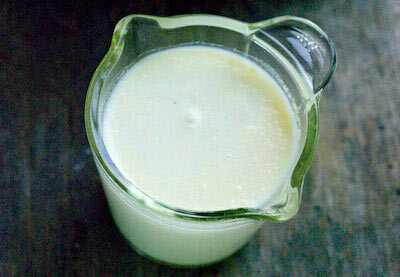 Push a piece of vanilla pod down the side of each jar so it shows against the glass. Top up with hot syrup from the pan if necessary, so the berries are submerged. De-bubble the fruit around the sides of the jar using a narrow spatula or chop stick to release any trapped air bubbles, wipe the jar rims clean and seal. Water process for 10 minutes then remove from the water bath and leave till cold. Check the seals and label your jars ready to store. If any of your seals fail, use the compote as if fresh*. For the remaining syrup in the pan, bring to a brisk boil for 5 minutes till the syrup is slightly thickened or to your liking. Pour into hot jars to the headroom line appropriate for your type of jar (Weck flasks can be filled almost to the top), tap the jar on the counter to release any trapped air bubbles, wipe rims and seal. Process for 10 minutes then remove from water bath and leave till cold before testing seals are fixed. 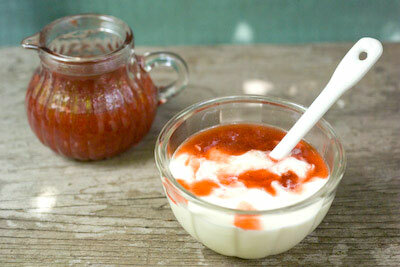 *If you don’t intend to water process the compote and syrup it should keep, if refrigerated, for about a week.